Sable, a bend dovetailed Or between a unicorn rampant and a dragon rampant to sinister argent all within a double tressure Or. The Honourable Lady Tierrynna Caer Narvon is a Companion of the Order of the Golden Lance and the Order of the Dolphin. She is a senior (yellow border) member of the Drafn warband. 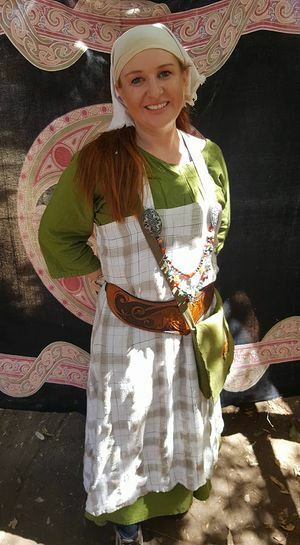 Originally known as Terah Caernarvon (registered name and device in the Kingdom of Artemisia), she is active in equestrian activities as well as the Drafn warband where she has served many feasts. She volunteers at local events and at Potrero War as well as helps promote and run the equestrian group for Calafia. She is willing to teach anyone who wants to learn more about horses and skill at arms games on horseback. In her "spare" time she enjoys going on long trail and beach rides with her horses. This page was last modified on 1 December 2018, at 16:26.